Why is music called the divine art, while all other arts are not so called? We may certainly see God in all arts and in all sciences, but in music alone we see God free from all forms and thoughts. In every other art there is idolatory. Every thought, every word has its form. Sound alone is free from form. Every word of poetry forms a picture in our mind. Sound alone does not make any object appear. Those words are from The Mysticism of Sound and Music by founder of The Sufi Order in the West and musician Hazrat Inayat Khan (1882-1927). He is one of those figures often associated with "supermarket spirituality", but there is much in his book for those prepared to accept that science does not hold every answer. Hazrat Inayat Khan teachings revolve around the centrality of vibrations - "Spirit descends into matter by the law of vibrations, and matter may also ascend toward the spirit", which connect with recent paths about al-Kindī, amplification, kinetic art, and the link between frequency response and audience response. Two appearances of the word God in the first paragraph will doubtless have triggered the exit of many readers. But for those still with me despite being wary of the "melting pot of religiosity", I also recommend The Book of Atheist Spirituality by André Comte-Sponville, a philosopher who believes "spirituality is far too important to be left to fundamentalists". Hazrat Inayat Khan also teaches the importance of wazifa - "the power of the word which works upon each atom of the body, making it sonorous, making it a medium of communication between the external life and the inner life". Jean-luc Fafchamps (b. 1960) wrote his Sufi Word for ensemble and orchestra despite the composer's admission that "I am not a Sufi, or even Muslim and I do not speak Arabic". 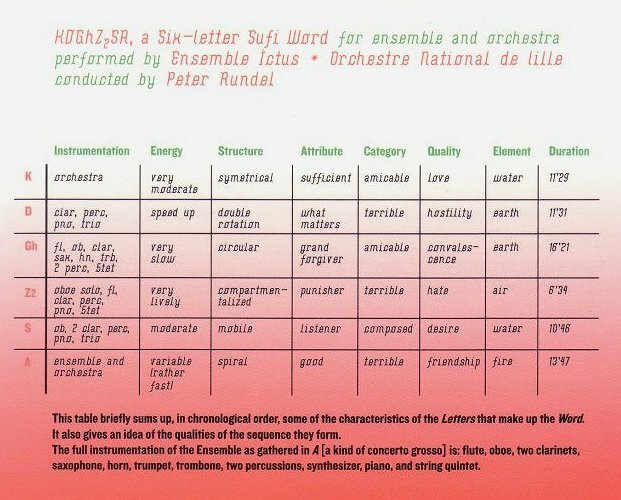 Sufi Word is a musical depiction of six letters of the Arabic alphabet triggered by the Sufi chart seen above (left click to enlarge) which maps the symbolic interrelations of the letters; the resulting composition uses "analogue correspondences as the basis for a system". 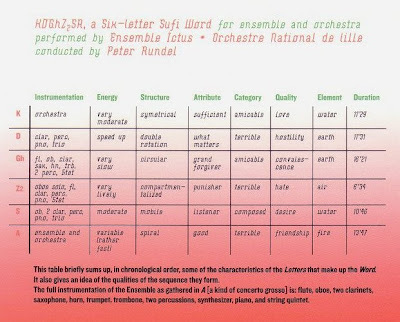 A CD of Sufi Word is available from left-field label Sub Rosa by Ensemble Ictus and the Orchestre National de Lille conducted by Peter Rundel. This recording is endowed with enough low frequency vibrations to satisfy both Hazrat Inayat Khan and those who think classical music should turn up the bass - there is a legal low-res file of the complete work here. Some may think that Sufi Word takes Hazrat Inayat Khan's injunction that sound alone is free from form too literally. 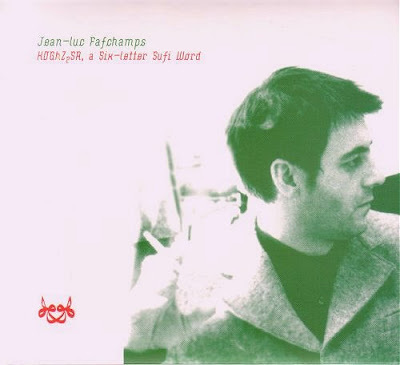 But Jean-luc Fafchamps is one of those musical explorers who cuts handholds that are sometimes beyond the reach of mere mortals, thereby providing a challenge to extend a puny reach that otherwise threatens to atrophy in today's ruthlessly moderated culture. "the power of the word which works upon each atom of the body, making it sonorous, making it a medium of communication between the external life and the inner life". I have no idea what this means. Further, I have no idea what it could possibly mean. I guess my atoms aren't sonorous. 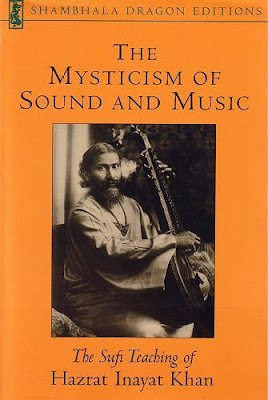 Hazrat Inayat Khan's Mysticism of Sound and Music and Comte-Sponville's book I am not acquainted with, but hope soon to be so. May I just share with you here, Bob, a little personal revelation of yesterday. Sometimes we don't notice trends in our own lives, and only yesterday did it strike me how few music blogs I now follow. Why is this? I follow yours assiduously for a number of reasons, but not the least by far is that I LEARN from them, and for this I am truly grateful. And there is too always the possibility of fruitful discussion. Others, I fear, have become more akin to a mode of advertising and promotion, with little or no discussion, and the frequent invocation of BBC 3 and its associates is patently at the heart of this. A great and utterly unhealthy change. Scott, after eight years of blogging I know my readers and already had you chalked in for a 'dislike' on that one. Please be warned, there is more to come and I have you chalked in for an even bigger 'dislike' next time. I suggest a quick trip to the pharmacy for some valium is in order.